Whoever said, "There are two types of travel, first-class and with children," obviously hadn&apos;t been to Lexington. With unique horse and historic attractions as well as some unusual twists on family classics, the Bluegrass offers first-rate fun for visitors of all ages. Explore a big park for horse-lovers. Lexington&apos;s Kentucky Horse Park is a great attraction for all ages. Youngsters especially enjoy the interactive exhibits at the museum, a parade of breeds called the "Breeds Barn Show" (daily, spring through fall at 11 a.m. and 2 p.m.) and t he wide-open spaces. The holiday light show at the park, Southern Lights, Thanksgiving through New Year&apos;s Eve, is also a big hit with young visitors. Open year-round. 859-233-4303 or toll free at 800-678-8813. Explore a little park for horse-lovers. The life-size horse statues at Thoroughbred Park also seem to fascinate young visitors. Perhaps it&apos;s because these statues of racing and grazing Thoroughbreds are so realistic they have supposedly even spooked real horses. Parents can relax and let the youngsters pet, touch and even climb aboard - the statues are bronze, so they&apos;re very hardy (and don&apos;t kick or bite)! This is a favorite photo location. You can&apos;t miss this park at the corner of Midland and Main Street. Get the saddle&apos;s-eye view. 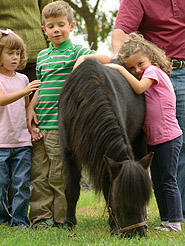 Several area stables offer scenic guided or unguided horseback rides for all levels of riders, including pony rides for younger children. Big Red Stables in Harrodsburg (859-734-3118) and Deer Run Stables in Madison County (615-268-9960) are open year round, weather permitting; and Whispering Woods in Scott County (502-570-9663) is open March through November. Age requirements vary. The Kentucky Horse Park offers trail rides spring through fall (859-233-4303 or 800-678-8813). Bluegrass Note: If your youngsters want to see some equine youngsters, just take a drive through the countryside around Lexington in the spring. Thoroughbred foals are usually born February through June. By the way, all Thoroughbred horses celebrate their birthdays on the same day. No matter when they were born, each year&apos;s crop of foals officially turn 1 (becoming yearlings) the following January 1. They&apos;ll never know it&apos;s a museum. Ages 12 and under in particular will enjoy the Explorium of Lexington, located in The Square. Nine galleries feature over 100 hands-on activities ranging from "walking on the moon" to enclosing yourself in a giant bubble. There&apos;s a special play area for toddlers. Open year-round. Closed on Mondays, except in the summer. 859-258-3253. Visit a high-flyin&apos; museum. Kids fly their own plane (simulated that is!) and enjoy other interactive aviation exhibits at the Aviation Museum of Kentucky, located at Blue Grass Airport. Two-day Aviation Camps are held in the summer for aspiring pilots ages 10 through 15. 859-231-1219. See stars at Hummel Planetarium. One of the largest and most sophisticated planetariums in the United States is located on the Eastern Kentucky University campus in Richmond (about a half-hour drive from Lexington via I-75 South). Future astronauts and other stargazers will enjoy learning about our solar system. 859-622-1547. Bluegrass Note: Many Lexington hotels offer special values and packages for families. Ask when you make reservations. 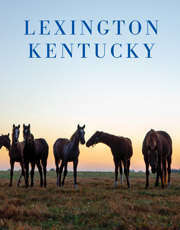 Or check out the Vacation Packages section of visitlex.com. Hit the trails at Raven Run Nature Sanctuary. Enjoy scenic hiking in the Kentucky River Palisades area, a getaway just minutes from downtown Lexington. Many special programs are offered, ranging from "insect walks" to stargazing. 859-272-6105. Mellow out with a riverboat ride. Bring the kids to Shaker Village at Pleasant Hill (about a 45-minute drive south of Lexington via US 68)and discover spaces to learn and play. There&apos;s plenty of romping room on its 3,000 acres. 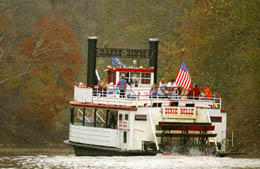 They&apos;ll love the hour long Kentucky River cru ise aboard Shakertown&apos;s Dixie Belle paddle cruiser. May through October. 859-734-5411 or toll-free, 800-734-5611. Paddle like a pioneer. Older children in particular will enjoy a canoe excursion along Elkhorn Creek, an historic and scenic Bluegrass waterway. Have a canoe? Put in at Oser Landing, Great Crossing Park or Cardome Park in Scott County, or rent a canoe by calling Canoe Kentucky at 800-522-6631. Follow in the footsteps of frontier explorers. In May of 1775 William McConnell and company heard about the first battle of the American Revolution while camped at a natural spring. In honor of the battle, they named their future settlement "Lexington." (Kentucky, not Massachusetts!) The site, off Old Frankfort Pike, is now known as McConnell Springs. Kids will enjoy the boardwalk across the wetlands in this urban oasis. Go fish (or paddle boating). While the younger children are enjoying the Creative Playground at Lexington&apos;s Jacobson Park, anglers in the group can cast their lines into the park&apos;s 47-acre lake (fishing license required for over 16). In the summer you can rent a pedal boat. Do something wild. Although the closest full-fledged zoos are in Louisville and Cincinnati, you can see an interesting variety of native Kentucky animals at the Salato Wildlife Education Center, on U.S. 60 near Frankfort (west of Lexington). Deer, wild turkey, bison, elk and bald eagles live at the center. There are also snakes and aquariums full of native fish species, along with other nature-oriented exhibits. 502-564-7863 or 800-858-1549. See some rock stars. Forget the ear plugs - we&apos;re talking about massive limestone bridges. These fascinating rock formations are part of the reason that Natural Bridge State Park and the Red River Gorge area (about an hour and a half drive from Lexington via I-64 East and Mountain Parkway) are so popular for hiking. The state park has a sky lift if you need a break from walking, or if you&apos;d simply enjoy a bird&apos;s eye view. Smile at a crocodile. It&apos;s actually an alligator, but if you&apos;re heading to Natural Bridge, reptile fans in the family will want to stop on the way at the Kentucky Reptile Zoo, which is chock full of snakes, lizards and other slimy creatures. Call ahead: 606-663-9160. Bluegrass Note: While in the Bluegrass, you might want to try the locally made soft drink, Ale-8-1, invented and bottled in Winchester, Kentucky. Parents, be forewarned however: It DOES contain caffeine. Get creative. Lexington&apos;s Creative Playgrounds take swinging and climbing to new levels. The massive play structures at Jacobson Park, off Richmond Road and Shillito Park, off Reynolds Road, include wooden towers, bridges, cars, even a lighthouse. They&apos;re perfect for when the younger kids want to run - and you want to rest. Explore the great indoors. Kids Place is a two-story-high playground with slides, rope bridges, "ball baths" and other climbing and jumping activities. It&apos;s located in the Lexington Athletic Club at 3882 Mall Road, off Nicholasville Road in Lexington. 859-272-5433. Offer your kids an indoor climbing adventure at L&apos;escalade Fitness on North Broadway (859-523-0518). Daily passes include gear. Bounce to the Moon. It&apos;s O.K. if the kids are bouncing off the walls--literally! What child wouldn&apos;t enjoy a warehouse-sized room filled with giant trampolines? Call ahead to reserve space at Sky Zone on Boston Road, and bring socks. 859-629-4455. On Brannon Road you&apos;ll find another popular trampoline park: Get Air. 859-629-4455. Tweak your Board. If words like ollie, nollie and melloncollie mean something to you, you&apos;ll probably want to head off to the skatepark in Woodland Park at the corner of East High and Kentucky Avenue. Bring your helmet. The park is open dawn to dusk. 859-288-2900. Accelerate the action. At Malibu Jack&apos;s Family Fun Center, a Nascar-style go-kart speedway, one of the largest arcades in Kentucky, mini-golf and a café could keep the family busy, and their adrenaline pumping, all day long. 3025 Blake James Dr. (859) 687-0401. MB2 Raceway is a new state-of-the-art indoor go-karting facility offering a high-speed race simulation on a challenging and unique road course that is fun for all skill levels and ages. 818-364-8000. Bluegrass Note: Look mom, a castle! Yes, there really is a real castle between Lexington and Versailles. It was begun as a private residence, but remained vacant and unfinished for almost forty years, making it the subject of much local rumor and speculation - not to mention drive-by gawking-over the years. It&apos;s now a luxury "guest house". Just take Versailles Road (U.S. 60) west from Lexington. You can&apos;t miss it. You can dine at the restaurant. Call ahead: 859-879-1000. Take ‘em down on the farm. The family that picks together, sticks together. Well, at any rate, even city kids will enjoy a trip to the country for fresh apples and apple cider, pumpkins, corn and other goodies at Eckert&apos;s Boyd Orchard, located near Versailles (859-873-3097) and Evans Orchard (502-863-2255) near Georgetown. Both have produce your kid&apos;s can pick themselves. Be sweet. How about a little treat to go with your farm-fresh fruits and veggies? Show your little sweeties how candy is made with a free tour at Old Kentucky Chocolates, 450 Southland Drive in Lexington (800-786-0579); or at Rebecca Ruth Candies, 116 E. 2nd St., Frankfort (502-223-7475). Do the pioneer thing. Youngsters love the pioneer schoolhouse and other old-timey stuff at Old Fort Harrod State Park in Harrodsburg (859-734-3314) and Fort Boonesborough State Park near Richmond (859-527-3131). At Fort Harrod, there&apos;s also a huge Osage Orange tree, irresistible for climbing. Fort Harrod and Boonesborough are open April through October. Follow tracks of all sizes. Make tracks to nearby Woodford County (west of Lexington via U.S. 60) for all kinds of old-time train fun. A fascinating collection of model trains and other playthings from the past is on display at Wanda and Winfrey Adkins&apos; Nostalgia Station Toy Train Museum, at 279 Depot Street in Versailles. The museum is housed in a renovated early 1900s railroad station. Open Wednesday through Saturday, 10 a.m. to 5 p.m. (859-873-2497). On weekends, spring through fall, the Bluegrass Railroad Museum runs vintage train excursions from Woodford County Park. The eleven-mile ride takes you through scenic Bluegrass countryside. The schedule also includes a variety of themed excursions, ranging from a staged "Train Robbery" to a "Clown Train." Call for times and schedule. 859-873-2476 or 800-755-2476. Make a historic crossing. Valley View Ferry is a rare treat - an old-fashioned paddle wheel ferry that carries cars across the Kentucky River between Fayette and Madison County. There aren&apos;t too many ferries like this anymore, and there aren&apos;t very many businesses of any type that are this old: the Valley View started operating in 1785, seven years before Kentucky became a state. To find it, take Tates Creek Road (Ky. 169) south from Lexington. Just like in the old days, if the river is too high, the ferry doesn&apos;t run. Call 859-624-4748 for the ferry hotline. Watch others act up. If you visit fall through spring, you may be able to catch a Lexington Children&apos;s Theatre performance. Thirteen plays are presented throughout the season. Lexington Children&apos;s Theatre has been offering live shows of interest to young people since 1938! (859-254-4546 or 800-928-454). Arts and sciences. Created in the late 1960s to promote arts and science education, the Living Arts & Science Center is a favorite place for young Lexington residents to take classes in everything from cartooning to nature study. However, young visitors to the city might be interested in stopping by to see what&apos;s on exhibit in the center gallery. It could be paintings, sculpture or something scientific. Plus, there&apos;s a planetarium. The center is housed in an historic mansion at 362 N. Martin Luther King Blvd. in downtown Lexington. 859-252-5222. Bluegrass Note: Alert the kids to the possibility of a "blue horse sighting". 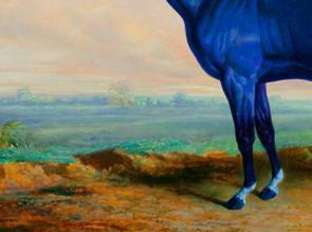 Legend has it that a horse nicknamed "Big Lex" turned blue from grazing in nourishing bluegrass pastures his entire life. Be on the lookout as you drive the back roads around Lexington, Kentucky. Putter about. What&apos;s a family vacation without a round or two of miniature golf? Check out the three 18-hole Biblical-themed courses at the Lexington Ice Center (560 Eureka Springs Drive, 859-269-5681) or battle the traditional windmills and loop-the-loops at White Haven Miniature Golf and Driving Range (100 Yorkshire Blvd., 859-263-5310). Go around and around. Year-round, you can go roller skating at Champ&apos;s Rollerdromes, 297 Ruccio Way in Lexington. They have laser tag and putt putt, too! (859-268-3888). Fall through spring, you can take to the ice at the Lexington Ice Center, 560 Eureka Springs Drive, (859-269-5681). Stay out of the gutter. Collins Bowling Center adds to the 50&apos;s vibe of the Southland shopping and dining area. If the kids are having trouble sleeping, maybe all night Cosmic Bowling is your answer. 859-277-5746. Go shopping in a big way. If there are teens in your group, they&apos;ll probably want to visit the mall. Lexington loves to brag that it has the largest mall in the state! Fayette Mall on Nicholasville Road has over 200 stores and restaurants. Younger children will find stores to like here, too, notably The Disney Store, which features all kinds of official Disney-character merchandise, and the Build a Bear Workshop where children can create their own stuffed animal "from scratch." The Summit at Fritz Farm is another huge shopping area, just across the road from the mall. Your kids will love the interactive, Kentucky-themed play area, which happens to be located very close to terrific food options, including the Shake Shack. A real page-turner. If your children love to read (or you would love them to), plan to stop at Joseph-Beth Booksellers in The Mall at Lexington Green, also on Nicholasville Road. Joseph-Beth was named America&apos;s Best Bookstore by Publisher&apos;s Weekly and is one of the largest bookstores in the nation. Joseph-Beth Kids, located on the lower level, is like a store-within-a-store. There&apos;s a large selection of books and educational materials, with a seating area for those who want to read on the spot. The store sponsors many special events for readers of all ages. 859-273-2911. Read, play, learn! There is nothing stuffy about Lexington&apos;s Public Library system. With six branches, there will be a library close by, and they offer an astonishing number of activities designed for even the youngest among us. Call (859) 231-5500 and find out what is going on while you are in town. Ramsey&apos;s Diner has a casual, homey atmosphere; a down-to-earth menu (you can even get a peanut butter and jelly sandwich); and is lively and noisy - just the kind of place kids love. There&apos;s even a toy box, to help entertain young diners. Parents will love the friendly service, reasonable prices and well-prepared "comfort foods." There are several Ramsey&apos;s locations: 151 West Zandale, 4053 Tates Creek Road, 3090 Helmsdale Place and 4391Old Harrodsburg Road. If your family likes pizza or Italian food, you&apos;ll want to check out Joe Bologna&apos;s, 120 W. Maxwell (859-252-4933), close to both downtown and the University of Kentucky campus. Joe B&apos;s is a Lexington institution, famous for its pizza and its delicious, dripping-with-butter breadsticks. Youngsters will also enjoy the decor: The restaurant is located in a renovated church; you can even dine in the choir loft overlooking big stained-glass windows. Gattitown, 2524 Nicholasville Road (859-277-2323) gives new meaning to "drive through." They have bumper cars! Watch cartoons in the Fun Flicks room or sports in the Sports Room. Play video games in the Game Room. All this and a great pizza buffet, too. If you grew up cruisin&apos; the local drive-in during the ‘50s, you can give your kids a real taste of those "happy days" at the Parkette Drive-In, 1230 East New Circle Road (859-254-8723). Many restaurants recreate the ‘50s, but with its vintage sign, carhops and "Kentucky Poor Boy" double-decker cheeseburger, the Parkette remains much the same as it was when it opened in 1951. This is a deep-fried slice of pure Americana. Written by Teresa Day, a freelance writer based in Lexington, KY.